[prMac.com] Taipei, Taiwan - QuinnScape today releases a new update for its popular travel app, Packing Pro. Update 9.2 gives Packing Pro a revamped design that more closely complements Apple's new iOS 7 look and feel. Its flat, streamlined, modern look removes the ornamental clutter of past versions and now lets users concentrate more easily on what's most important to them - the actual content. Besides the facelift, additional functionality and improved usability have been added to the app, just in time for the busy end-of-year holiday travel season. Since its launch over 4 1/2 years ago, Packing Pro has been highlighted on Apple's App Store several times. Currently, it can be found in the "Essentials" promotion. It has also ranked at #1 for iPads and #2 for iPhones in the U.S. App Store's Travel section. Besides Apple, Packing Pro has also been recognized by CNN, WSJ, BBC, and Budget Travel, and has earned glowing reviews on major tech and app blogs (Gizmodo, Mashable, Macworld, CNET, TUAW and iPhone Life, among others). 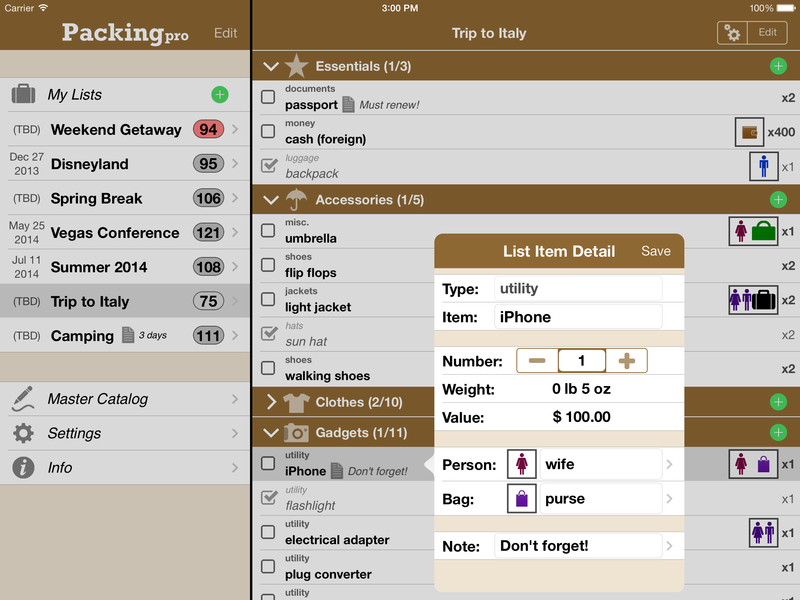 With update 9.2, Packing Pro's new iOS 7-inspired design facelift brings the app into the modern age. This, in combination with the usability enhancements and additional functionality, should be a welcome gift for travelers during the upcoming holiday travel season. Packing Pro is a universal app that is available for purchase worldwide on the iPhone & iPad App Store for US$ 2.99, or the equivalent in local currency. The basic Packing (+TO DO!) sells for US$ 0.99. Since its founding in October 2008, QuinnScape has been managed by Quinn Genzel. Quinn is best known for his popular, top-ranking travel packing apps: Packing (+TO DO!) and Packing Pro. Packing Pro has been recognized by Apple, CNN, WSJ, BBC, National Geographic, Budget Travel, Fodor's, CNET, Macworld and a host of others as one of their top apps for traveling. Other app created by Quinn include a grocery shopping list app (Shopping Pro), nature appreciation apps (iLove Nature and iLove Birds), 3D VR action games (R.I.P and Ghost Buddy) and high-quality puzzles (the aQ's Pro Slider Puzzle series). Copyright (C) 2008-2013 QuinnScape. All Rights Reserved. Apple, the Apple logo, iPhone, iPod and iPad are registered trademarks of Apple Inc. in the U.S. and/or other countries.